These long range rotary sprinklers are recommended for golf courses, parks, athletic fields and other large turf areas. Heavy duty construction ensures long life and trouble free service. Impact Drive actuated by nozzle stream and a recoil torsion spring. Anti-Backsplash Arm eliminates wasted water. Redirects sidesplash into the main stream. Standard on a all part circle models PK50A and PK60A full circle. The PK50AF and PK60AF utilize a single, high performance brass nozzle. The PK 70AF and PK80AF incorporate dual brass nozzling utilizing the secondary (small) nozzle to actuate the impact torsion drive, thereby assuring uniformity of large area coverage. Part Circle Models have a single, high performance brass nozzle. Trip Collars on all part circle models adjust the arc of coverage from 5Â°-355Â° with detents every 7-1/2Â° to retain arc selected. Screwdriver Adjustment of Stainless Steel Arm Torsion Spring Through cover to "fine-tune" sprinkler while in operation or "off" positions. All Internal Components are easilty removable from above ground as an integral assembly. Diffuser Pins for distance control and stream break up are standard on all part circle sprinklers. Full circles have specially designed nozzling to ensure close-in coverage. Free Turning Coves swivel under surface loads, thereby preventing sprinkler damage. Large Water Channels reduce pressure loss, improving sprinkler efficiency and performance. Check Valve prevents unsightly puddling caused by lateral line drainage at low heads. The check valve also minimizes damage to pipe, fitting and sprinklers caused by high velocity surging in empty lines. Valve opens against 15 ft/hd. (4.5 m/hd.) of water. New, "extra strength," high impact engineering grade plastic housing. Molded-in brass inserts provide positive threading for stainless steel retainer bolts. O-Ring Seal under retainer gland makes field reassembly easier and provides sealing action superior to a gasket. Internal Sprinkler Assembly is fabricated brass, stainless steel, cast bronze and non-corrosive plastics. 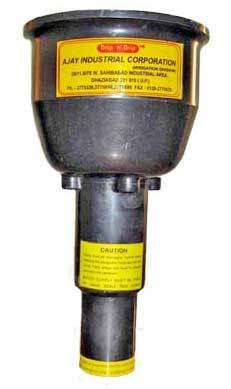 Each Sprinkler is Factory Tested and calibrated at its rated intermediate operating range. Rubber Cover - Green (XR58A) or Black (XR58BL), full molded rubber cover with rubber housing ring; allows sprinklers to be set flush to grade. Cover has center plug for access to cover screws and arm spring adjustment. Vandal Resistant Cover Screws (XV58) Special Tool required for removal.